De altviool is meer dan alleen muziek, lees hier verhalen, recensies, interviews en adviezen. Geschreven door het bestuur van de DVS zelf! Wilt u ook plaats nemen in de redactie voor de website? Heeft u ook behoefte de “pen” te hanteren? Allerlei informatie is welkom! Het bestuur ontvangt met belangstelling uw artikelen, recensies en andere informatie met betrekking tot de altviool, deze zullen wij dan op de website plaatsen! 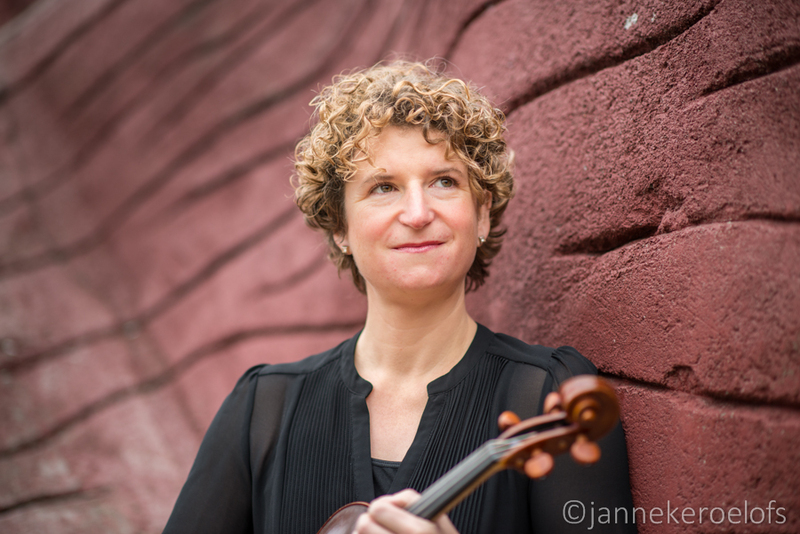 Stuur uw ideeën naar mail@dutchviolasociety.nl! 15:00 welkomstwoord en presentatie van de grootse plannen van DVS voor 2018! 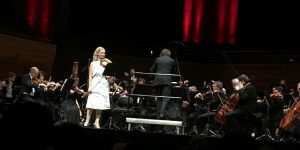 16:30 na een kleine pauze zullen Luca Altdorfer, Kristofer Skaug en Elisabeth Smalt een verslag geven van het International Viola Congress in Wellington, waar zij begin september een bijdrage aan leverden. Entreeprijs: €5,- aan de deur (ook voor Splendor- en DVS-leden). Of voorverkoop via deze link. Tuesday Sept. 5th, the last day of the 44th International Viola Congress: Fortunately, it has been so busy that there was no time to get nervous about my own lecture this morning, titled “Viola resources, archives and databases worldwide: How to locate and preserve our repertoire“. 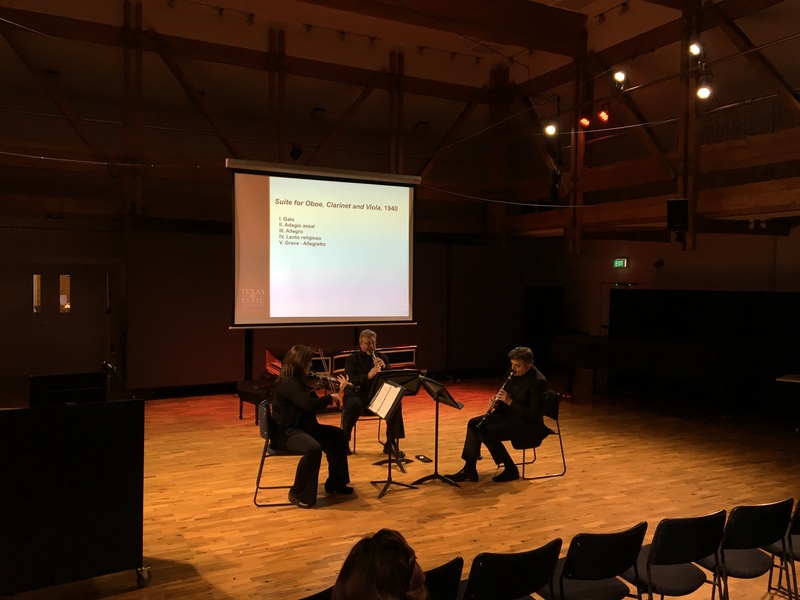 A joint undertaking with Daphne Gerling (AVS) and Myrna Layton (Primrose International viola Archive), resulting in a combined 40-minute presentation and 10 minutes left for Q&A with the audience. Considering the early time slot at 9AM, the attendance was really good, and there seems to be interest in a follow-up at future IVC congresses. During the break after our presentation, I went on a shopping spree in the exhibition area and bought a block of “Bespoke Rosin” (can’t wait to find out how that works! ), and various books of sheet music. 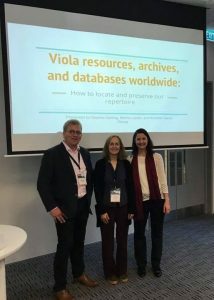 At this point, I also started handing out our super cool IVC Rotterdam stickers, ensuring that everybody brings home a bunch of stickers to distribute among their viola friends. 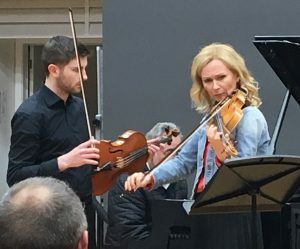 In the afternoon, the venue once again switched to St. Andrews on the Terrace, where the Augusto Vismara Viola Ensemble gave a much-awaited concert. My expectations were quite high, as there were several premieres on the programme. Unfortunately, one of them was withdrawn because the composer – Augusto Vismara himself – could not make it to the Congress. The Andante Cantabile for Viola Quartet by Hendrik Waelput is no novelty, but it is rarely performed by a good set of professionals – which evidently is what it takes to make this piece truly interesting. This was followed by two transcriptions of Haydn’s Baryton Trio no.7 and Divertimento no.1. Very well done, although the Italian temper at times took the interpretation a bit to the extreme. 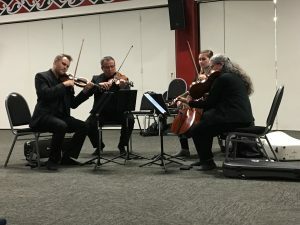 Pietro Mascagni’s instrumental evergreen Intermezzo from Cavalleria Rusticana is always sure to tug at the heartstrings of the audience, but this viola quartet rendition evoked enthusiastic applause above expectations. One could tell that the performers themselves enjoyed it, too. Robert Kahn (1865-1951) has left us a Serenade (op.73) which is originally for oboe, horn and piano. But he also had the good taste to provide an alternative instrumentation for 2 violas and piano, which was presented here. A very passionate piece of music, but in the end I found it a bit long. Perhaps my ears and mind were just too tired to absorb such a dosage of sound after almost 5 full days of viola music. The best was saved for last: The world premiere of Waves for four violas and piano, by Giorgio Mirto (1972). It starts calmly, but builds up with John Adams-like ostinatos (mostly with a warm-blooded viola melody on top) and culminates in a lot of Italian temperament before it ebbs back out into the initial serenity. The applause from the very enthusiastic audience was rewarded with a short recap of the Intermezzo by Mascagni. For the very last regular presentation session of this congress, I chose to attend Raquel Bastos’ lecture recital “Essencia Urbana: from composition to interpretation“. Raquel discussed the interactions between herself and composer Cecile Elton in the project Essencia Urbana, compositions inspired by Portuguese and Argentinian poetry. 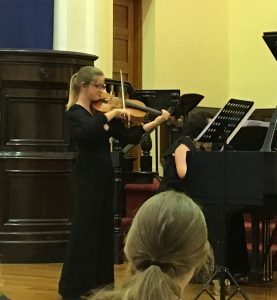 She also played different parts of this suite as she went along, and in the end the music itself was (for me) the most memorable part of this presentation. Just like last year in Cremona, the official Closing Ceremony of the Viola Congress was marked with a performance of the massed viola orchestra, playing a selection of Michael Kimber works under the baton of Marcin Murawski. As one would expect from such an event, there are more violists on stage than in the audience, so it was very successful. Some of us perhaps regretted not having been able to attend all the rehearsals (sorry again, Marcin!). Nevertheless it was worth doing. So… for the festive celebration of a good congress: The Gala Banquet at the New Zealand Parliament Building (only 5 minutes’ walk from St Andrews) was a very chique event. ANZVS Secretary Greg McGarity and his wife played viola/violin duets by Beriot and others. A very fine performance! Then came the time for speeches, first by the New Zealanders themselves, and then by IVS president Carlos Maria Solare. He in turn passed the microphone to me, as it is IVC tradition for the Host of the next IVC to have the “famous last words”. My thanks went (and will forever go) to our hosts Donald Maurice and Gillian Ansell, as well as the absolutely amazing congress manager Elyse Dalabakis. The organization was flawless, and the heartwarming hospitality was way, way, way (!) beyond call of duty. It was an emotional moment for me to publicly blow out the candle for this year’s congress, and at the same time welcoming all Violists near and far to our congress in Rotterdam next year, with the words: “Tot ziens in Nederland“! Monday morning, September 4th: Time to put on my “IVC 2018 Committee Chairman” hat for a rise-and-shine meeting with the board of the International Viola Society, at Vice President Jutta Puchhammer’s hotel suite across the street. I come armed with a powerpoint presentation to help describe our congress plans for next year. I received a lot of helpful feedback and advice, and fortunately the board was quite happy with our direction so far. So I got their blessing to hold my “welcome to Rotterdam” speech at tomorrow’s closing gala dinner. In the afternoon we once again convened at St. Andrews on the Terrace. 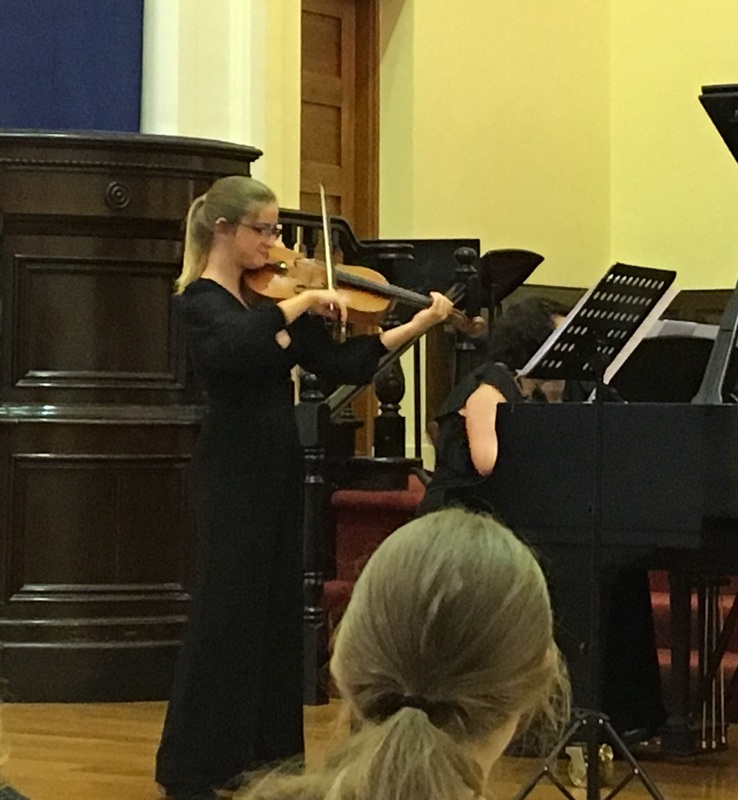 The “Wellington Congress Viola Orchestra” (consisting of students from the New Zealand School of Music) had readied itself for a string of solo concertos. Graupner’s double concerto for Viola d’Amore and Viola was a new discovery for me. Our host Donald Maurice could finally be heard on his favourite instrument, alongside Marcin Murawski on the viola. It was admirably performed. I did feel however that the orchestra was a bit oversized for such a piece (6 celli? ), as the Viola d’Amore at times was drowned out. Kenneth Martinson demonstrated impressive virtuosity in the Rolla D-major concerto, a real finger cracker. In a way it was a reminder of the various lectures and recitals on the topic of Rolla last year at the Cremona IVC. The orchestra now took centre-stage on its own, with the Suite no. 3 for strings by Respighi. A good find for the list of “works in which the viola section has a significant solo part”. Conductor Martin Riseley hauled this one ashore, with a big cheer for the intrepid foursome in the viola section. In Michael Kimber’s “Variations on a Polish Folk Melody”, our resident Polish Kimber-connoisseur Marcin Murawski had the lead role. After a dozen or so variations, Renée Maurice appeared behind the orchestra to give us the vocal rendition of said folk song, with a very convincing Eastern European intensity. But contrary to expectation, this recurrence of the main theme did not signal the beginning of the end, more like the halfwaay milestone. There was lots more work to do for Marcin Murawski and the orchestra, which seemed to enjoy indulging in the Polish swagger . All in all, much pleasure was had! The audience could just stay in their seats for the next concert, which was another “Potpourri” session. The first piece was “Siete canciones populares españolas” by Manuel de Falla. An appropriate amount of mediterranean temperament surfaced towards the end of the suite. Good work by the lone Spanish congress delegate Gema Molina Jiménez, who confusingly has a Swedish flag and a Moose-warning sticker on her viola case. 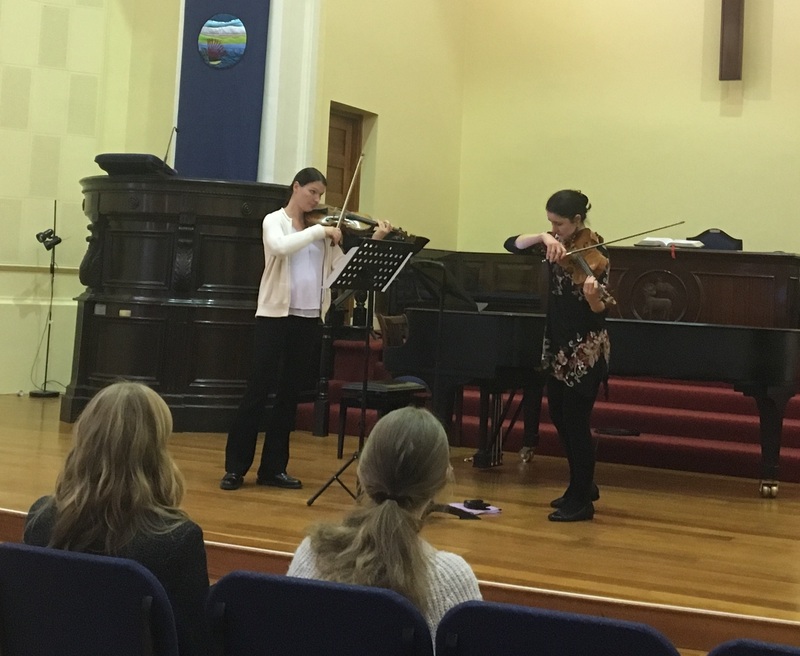 The duo Katrina Meidell and Daphne Gerling played “In Paris with You” by Shawn Head. The mood of this piece struck me as nostalgic. Elisabeth Smalt came on stage to complete her advocacy for “silent music”. In “Woman, Viola and Crow” by Frank Denyer, the vocabulary of the music was augmented with high heels hammering on a plate, rustling seashells, and occasional crow-calls. An eerie acoustic landscape is created. This music seems in a way beyond “like” or “dislike”, it just is. 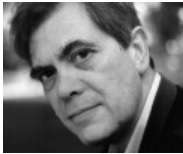 The same might be said for Morton Feldman’s “The Viola in my Life III” (1970), now with a piano interacting in a very elemental way with the viola sounds, no more crowing, shell-rustling or foot-stamping, what remained were pizzicato’s and solitary bow strokes. By thus taking away sound by sound, silence was approached. The next section of the concert consisted of works by Penderecki, performed by Daniel Sweaney. 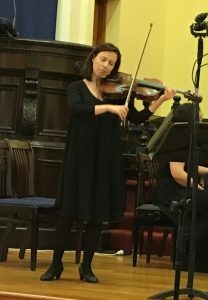 The “Sarabande, Tempo di Valse, Tanz” for solo viola exposed a very warm and pleasant sound from the viola. Sweaney concluded with Penderecki’s “Duo: Ciaccona” together with Annette-Barbara Vogel (violin), a beautiful piece. 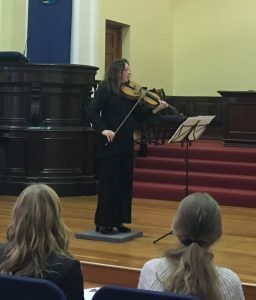 Last but not least, Andrea Houde appeared with a world premiere performance of a Viola Concerto composed by her student C.F. Jones. The first section is quite melancholic, but the music picks up more energy as it progresses. After a “working dinner” with Daphne Gerling at the local Thai cafeteria for our presentation tomorrow, time had come for the big Gala concert in the Michael Fowler Centre – the home of the New Zealand Symphony Orchestra (which by the way is frequently led by Edo de Waart). A beautiful concert hall with impeccable acoustics. The programme title was “The Three Altos“, referring to the three soloists: Two “local heroes” – Roger Myers and Roger Benedict – and the proclaimed diva of this congress, Russian-Italian Anna Serova. The first performance of the evening was an arrangement of Schumann’s “Märchenbilder” for viola and orchestra, with Roger Myers as a soloist. He has an extravagant playing style, which resulted in heavy articulation where none was warranted. The 3rd movement (Rasch) was by the same token executed at stunning speed, bravo for that! Next followed two world premieres, both with Anna Serova in the spotlight: “Lady Walton’s Garden” by Roberto Molinelli is a miniature concerto (and served very well as prelude to the Walton concerto itself, later this evening). It describes the beautiful garden La Mortella (?) on the island Ischia near Napels, which was the life work of Sir William Walton’s wife. She came from Argentina, so the Finale is a Tango. Serova took this challenge and – to our delight – put the viola aside for a 2-minute dance show on stage. 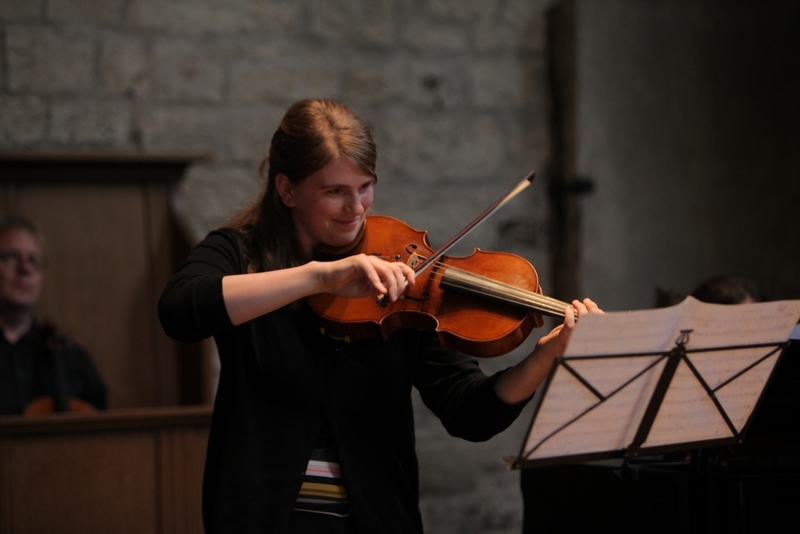 I can’t think of another violist who could copy this feat (maybe Isabelle van Keulen? at least she likes to play tango’s). performed to wide acclaim by Roger Benedict. The 5th and final installment of this blog will appear tomorrow, Sept. 8th. The second day of the 44th International Viola Congress started with an early uphill battle against time and gravity to reach the campus of the Victoria University Wellington (VUW), which is the main venue for most Congress proceedings from here on out. At 8 o’clock sharp (!! ), a surprising number of violists of all ages and nationalities gather for the first rehearsal of the Massed Viola Orchestra, conducted by Marcin Murawski. 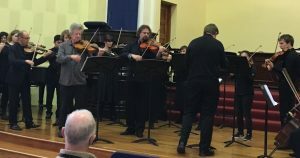 The repertoire is entirely dedicated to the oeuvre of Michael Kimber, a household name for anyone previously involved with viola ensemble playing. Classic titles such as the “Viola Fight Song“, “Three Quirky Little Pieces” and “I am Lost without my Beautiful Viola” (sic) are on the music stands. Considering the aforementioned variety of players, the first run-through went very well – and we have daily rehearsals until our performance on Tuesday afternoon! 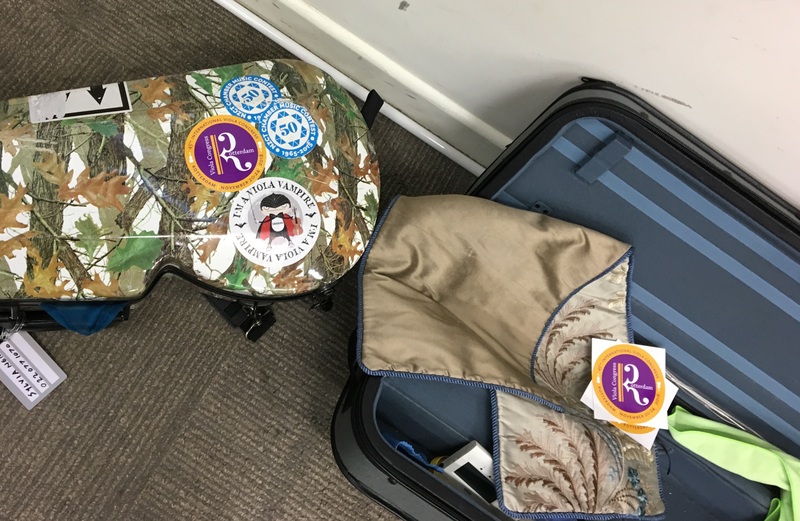 Donald Maurice has kindly lent me a viola from the faculty stores, as I didn’t have the guts to wager my own viola to the Wild West of carry-on luggage rules for this long trip. 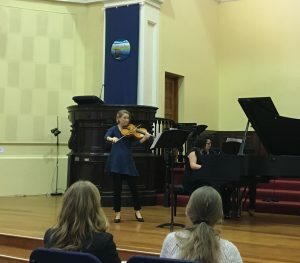 The Congress itself resumed today with lectures and recitals in several halls of the New Zealand School of Music and the McDiarmid building. A central space is designated as showroom for luthiers, mostly from Australia and New Zealand. My first visit went to a lecture with the captivating title “Dancing with Death: Shostakovich and Bartok’s Last Viola Works“. Natalie Stepaniak from the University of Northern Colorado had prepared a compressed presentation of this weighty topic. Unfortunately my head was not up to the task of absorbing this lecture at full speed at this time of the morning (if at all…). Next up was a recital of repertoire for Oboe, Clarinet and Viola: Violist Ames Asbell from Austin (Texas) brought two colleagues from orchestra to perform these works by (presumably American) composers such as Randall Thompson and Alvin Etler, ending up with the emotive “Three Armenian Impressions” by Michael Kimber. For trivial reasons, I unfortunately missed the Midday Concert by Roger Myers, dedicated to the Bach family. Instead I was comforted by a catered sandwich lunch and a test drive of some of the showroom violas. 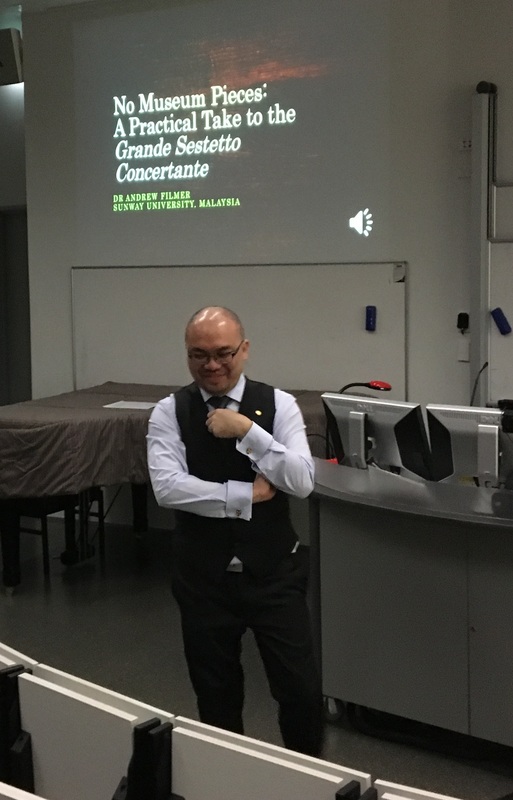 Andrew Filmer’s lecture “No Museum Pieces: A Practical Take to the Grande Sestetto Concertante” blew away what was left of my regretful mood. 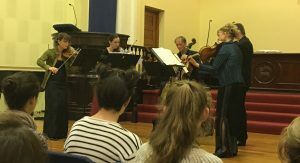 He presented the anonymous transcription of Mozart’s Sinfonia Concertante for string sextet (downloadable for free here), demonstrating through various fragments (with score) how the Grande Sestetto can be used as a vehicle to get “buy-in” from violinists to learn this piece, by using it as chamber music repertoire rather than a Concerto. This should soften the learning curve and thus make the Concerto itself more frequently programmed in the future. Which is of course something that violists really want! The violin and viola solo parts have been attractively redistributed among the ensemble players (all except for the poor 2nd cellist), creating lots of enjoyable dialogues between these parts. Mr. Filmer also presented his own pragmatic adaptations to the sextet, in the form of ossia-solutions for awkward (originally viola) passages currently assigned to the 1st cello, basically letting the violas repossess those bits (smirk). Jutta Puchhammer’s presentation “Pièces de Concours (1896-1938)“, constituted a well-deserved and well-used second chance for her to promote this work, after her initial effort at the Cremona congress last year fell victim to a freak schedule clash. She gave full evidence of a work of great dedication over the past several years to edit and publish a collection of rediscovered examination pieces commissioned by the Conservatoire de Paris from 1896 onward. 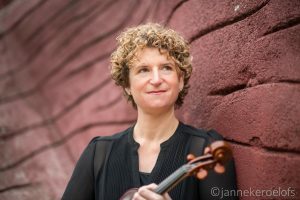 Not only has she created a prize-winning three-volume edition of the sheet music (which instantly sold out after her lecture), mrs. Puchhammer has also recorded all of these pieces herself on CD, conceding no quality compromises in her rendition of this exceedingly virtuosic music. In the Adam Concert Room of the School of Music, IVC44 featured artist Anna Serova gave masterclasses. I watched her coaching Henry Justo (Australia) in the Brahms Eb sonata, putting much emphasis on expression in vibrato and tonal quality. The 2nd student was Liudmila Kharitonova, probably by no total coincidence from Serova’s own home town of Arkhangelsk (Siberia). Her Allemande from Bach’s cello suite no.6 was already of great beauty from the outset, so it was fascinating to see Serova improve it further, in countless little details of bowing and phrasing. 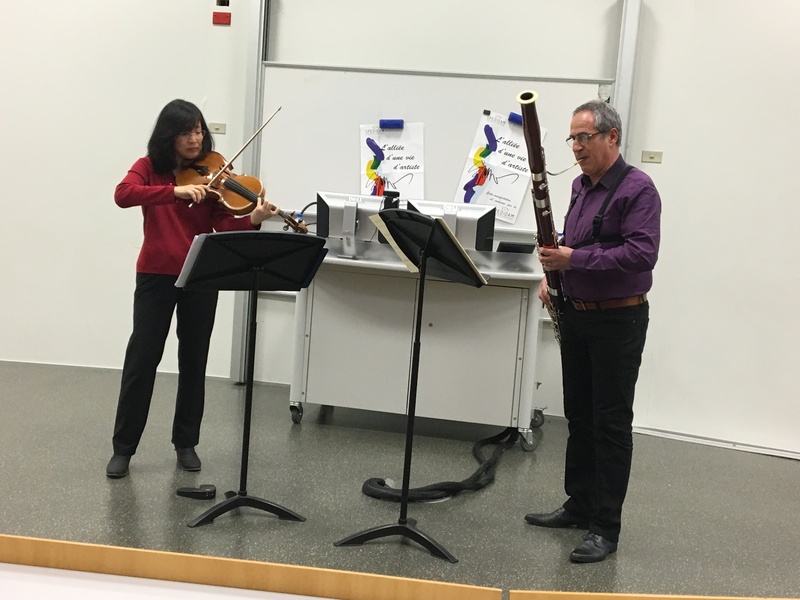 I nevertheless decided to skip the 3rd and last student’s masterclass, in order to catch the lecture-recital on Chamber music for viola and bassoon: presented by former IVC36 host Nancy Buck of the University of Arizona together with French bassoonist Franck Leblois. 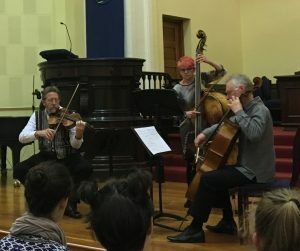 At this point there were 3 parallel congress sessions running, and the Viola/Bassoon session unfortunately drew the short straw in terms of audience. Their loss! Kicking off with 8 duo’s (1995) by Philippe Hersant, a bassoonist-composer married to a violist; continuing with Comptes de Nuit (2008) by Swedish composer Eberhard Eyser: two pleasantly calm movements with a more lively middle section. The piece “Double Invert” (2016) by Ruth Matarasso explored different ways of bending out of a unison note, and had many other interesting effects including “multitonal” notes on the bassoon (raw and “imperfect” reed vibrations that one otherwise would discard as unwanted transients). The session concluded with a world premiere performance of the 3-part piece “AB” by a certain monsieur Petit, with an 18th century classical style first movement, followed by a calm movement and ending in a merry gallop. An inspiring presentation, begging the question why these 2 instruments don’t engage in duets more often! 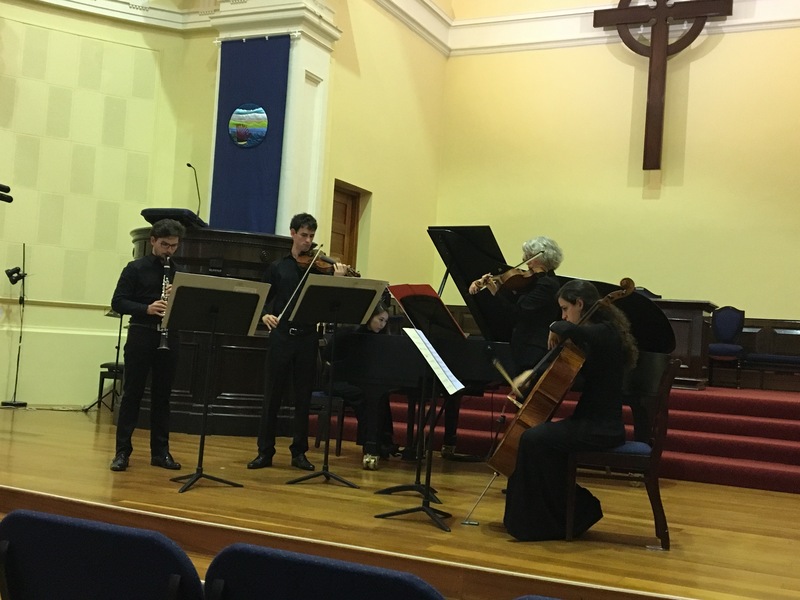 This evening’s “Potpourri” concert at St. Andrews offered a very comprehensive programme: Bruch’s 8 Stücke, a string trio, Mozart’s g minor quintet, followed by a Turina sextet and the Mendelssohn octet. Donald Maurice did his best to diminish the psychological challenge by suggesting we regard it as two separate, consecutive concerts. This mental trick almost worked for a good while. The Bruch pieces were special in that the clarinet had been replaced by saxophone, which worked very well. 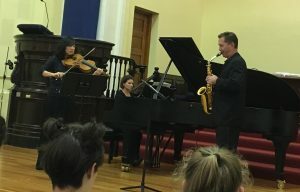 In some parts I felt that the saxophone was somewhat too expansive; but elsewhere it compensated with a richness in tone that is difficult to imagine from a clarinet. Again it was Nancy Buck taking care of the viola part, with Christopher Creviston on sax and Hannah Creviston at the piano. William Bolcom’s Fairytales trio for Viola, cello and Double bass is a highly original piece of music with a lot of temperament and humour. Kudos to the NZ Amazon trio (Peter Barber, Robert Ibell and Vicki Jones) for a very engaging performance. For obvious reasons, Mozart’s String Quintet no.4 in g minor (KV516) is regarded by many as the most beautiful among his viola quintets. The opening theme alone is charming enough to melt a polar ice cap or two. 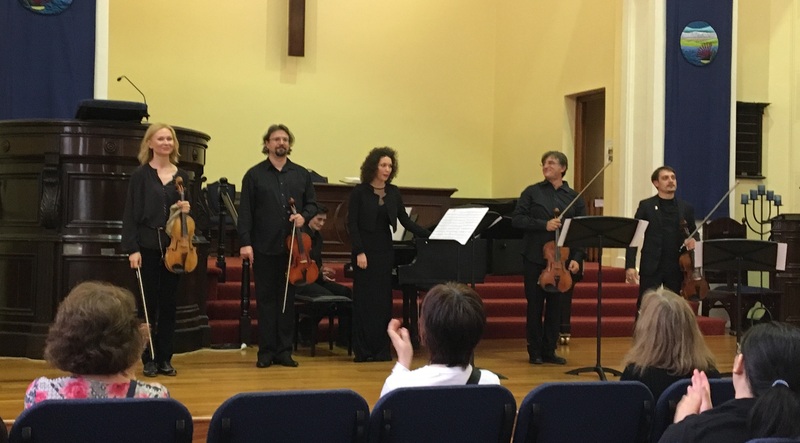 The acclaimed New Zealand String Quartet, joined by Roger Benedict as the essential 2nd viola, gave a very warm and inspired rendition, concluding the first of the “two concerts”. The “Second concert” started with Joaquin Turina’s Scène Andalouse for viola, piano and string quartet. 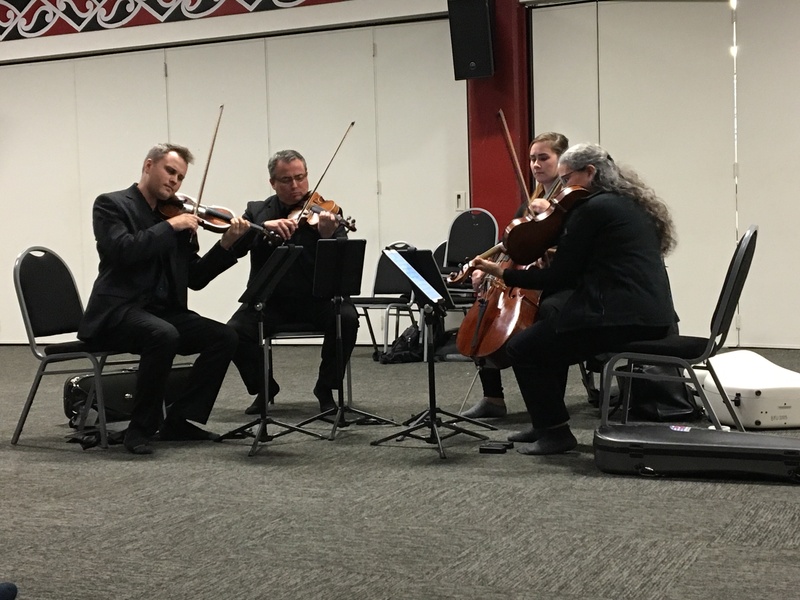 The Deseret String Quartet hosted Anna Serova as solo violist and Jian Liu on the piano. Rich in moods, this piece flooded the last empty spaces in my head with warmth, and I spontaneously decided to call it a night. 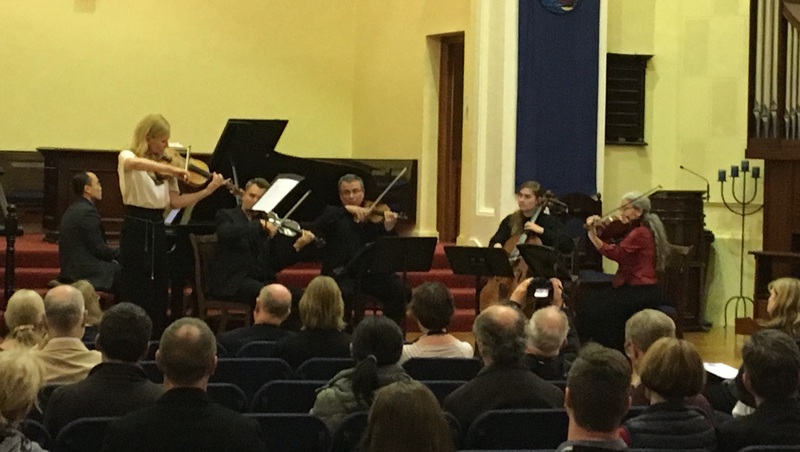 As for the Mendelssohn octet I left behind – fun as it may be – the prospect of hearing it while hanging upside down at a viola congress in New Zealand didn’t really add enough perspective for me to risk overkilling a wonderful day. After roughly thirty hours in airborne hibernation, I landed yesterday in Wellington (New Zealand) for the 44th International Viola Congress (IVC). It is a very special experience to travel halfway around the globe, only to be greeted with warm cheers, as if you were a regular. This was the case last night at the pre-congress dinner. I shared a table with board members of the International Viola Society (IVS) and our host, Donald Maurice. The atmosphere was great from the first minute! 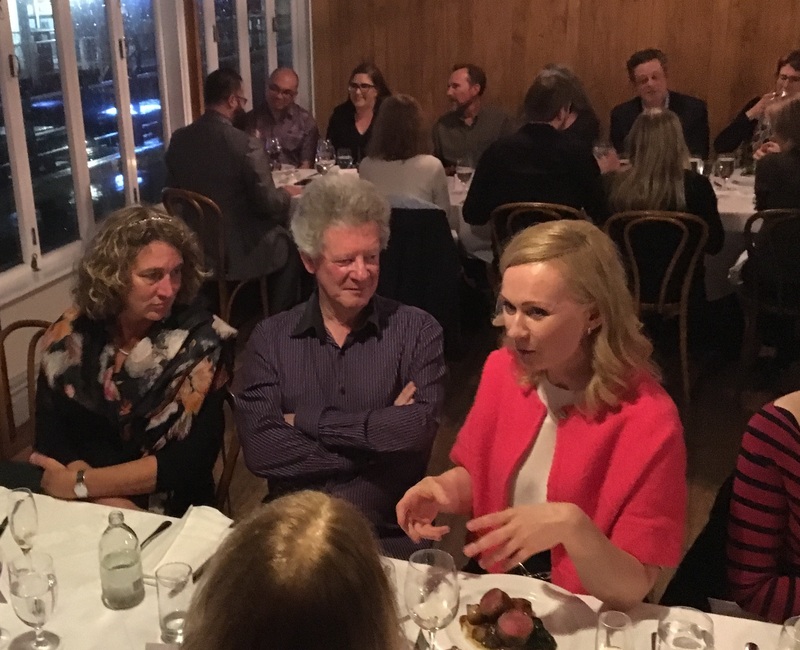 Pre-congress dinner, left to right: Jutta Puchhammer (IVS Vice President), Donald Maurice (IVC44 Host) and Anna Serova (IVC44 featured artist). This morning we converged at St. Andrews church to receive our badges, programme books and goodiebags. 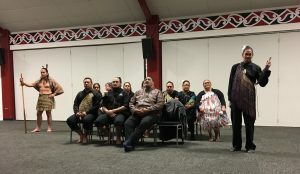 We then set off on foot for the Pipitea Marae, a Maori ceremonial house near the Wellington Parliament grounds, where we were to be treated to a great honour: a special Maori welcome ceremony known as the Powhiri. 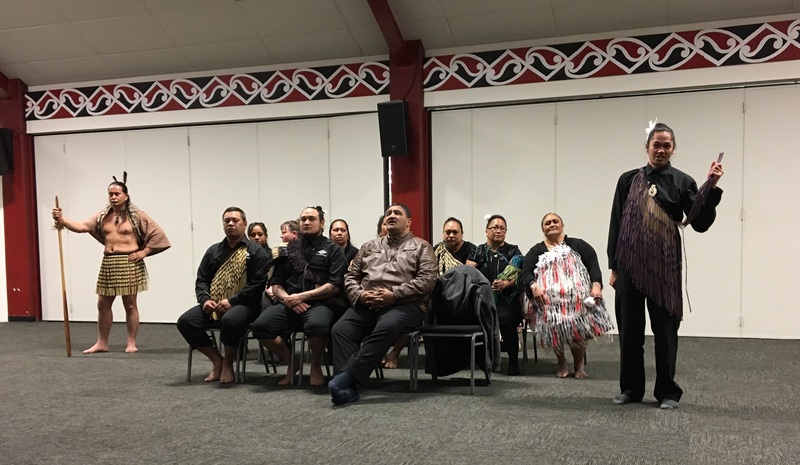 Initially we were met with Haka chants and the traditional nose greeting (hongi). 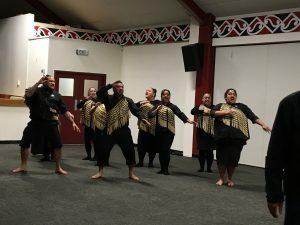 We, the visitors (manuhiri), were then introduced and vouched-for in Maori by Justin Lester, the Mayor of Wellington. Our native hosts in turn made long and (for most of us) utterly incomprehensible speeches, yet the honest emotions of warm hospitality and friendship were unmistakable! IVS President Carlos Maria Solare, having impressively rehearsed some Maori greetings of his own, reiterated our peaceful purposes. Each speaker’s pledges were sealed with chants. I cannot adequately describe the depth of this impression, and I’m sorry I can only say: you really, absolutely, had to be there! This ceremony was properly celebrated with tea and muffins and huge mounds of whipped cream. In a less formal mood, we were invited to join a crash course in Haka dancing, I couldn’t help thinking to myself that we will come up terribly short trying to match this welcome ceremony in Rotterdam next year! Now it was down to the core business of making music. The Deseret string quartet (from Brigham Young University, USA) brought a musical offering to our hosts with Ethan Wickman’s Namasté, which is a Nepali word for “I bow to you”. The double meaning of “bowing” at a viola congress was not lost on us :-). This very soulful music made me think of string quartets by Janacek, sometimes Ravel, but it certainly had its own originality. 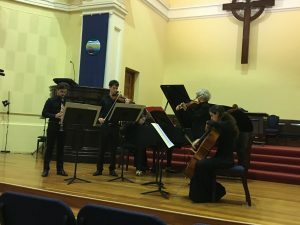 Back at St. Andrews, the Italian Viola Society made an important contribution with works of Italian composers, performed by Ensemble della Piattellina, led by Dorotea Vismara. Their programme was highly varied, I enjoyed most the romantic Piano Quartet by Giulio Roberti (1829-1891 – yet with a remarkably raw dissonant chord in its 1st movement!) and the fascinating quintet Centauro Marino by Salvatore Sciarrino. 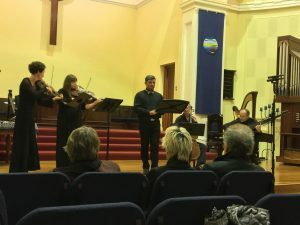 The programming of the evening concert in St. Andrews would seem to reflect our host Donald Maurice’s warm interest in early music (being a renowned viola d’amore player himself), as the Pandolfis Consort brought us 17th century works with gut-stringed viola da braccia, violetta, cello, théorbe and a marvellous countertenor (Nicholas Spanos). To my ears, the Stabat Mater by Giovanni Felice Sances (1600-1679) with its idiomatic descending chromatics was particularly memorable. Following a short intermission, the evening programme closed with the Arnold Bax sonata for viola (Sophia Acheson) and harp (Ingrid Bauer): a powerful reminder of how very well Bax knew how to compose for the viola. Admirably performed! The pub The Old Bailey on Lambton Quay has been appointed as “official waterhole” for the IVC, but disappointingly many delegates are still overwhelmed by jetlag and unable to keep on their feet. Having no musical obligations of my own beyond the massed viola orchestra (8am rehearsals! good grief…), I decided to ignore my more or less obliterated internal clock, and had a few good New Zealand brews with the local violists. A perfect end to a wonderful first day. And still we have four more jam-packed days of congress to look forward to! PS. Aan onze nederlandse lezers: Vanwege tijdgebrek moet ik mijn gewoonte om alles in het nederlands te schrijven en daarna in het engels te vertalen nu even loslaten… het blijft dit keer in het engels! Ik hoop op jullie begrip. Met ingang van deze zomer vinden er een aantal bestuursmutaties plaats binnen de DVS. Ten eerste zal Stijn van der Schoor, die sinds de oprichting van DVS in 2012 als Secretaris in het bestuur heeft meegedraaid, zijn functie neerleggen. Wij danken Stijn voor zijn jarelange trouwe inzet! Daarnaast heeft ook Iris Frederiks, die sinds 2 jaar als student-bestuurslid in functie was, wegens drukte besloten om te stoppen. Om beide vacatures tegelijk te vullen, stapt Ursula Skaug in het bestuur als Secretaris en student-bestuurslid. In het onderstaande stelt ze zich aan jullie voor. (lees hier een compleet overzicht van huidige bestuurssamenstelling). Mijn ouders zijn bepaald niet standaard; mijn moeder is beiaardier/arts en mijn vader is ruimtevaart-ingenieur en amateur-altviolist (en ook bestuurslid DVS). Ik vond het vrij normaal om ‘s ochtends met mijn moeder in een cabine hoog op de toren naar het carillon te luisteren, en – toen ik iets ouder was – in slaap te vallen bij mijn vaders kamermuziekgeluiden. Bij deze opleiding mochten muzieklessen niet ontbreken, en zo begon ik met viool spelen toen ik vier was. Vanaf mijn zevende kwamen daar ook pianoles en veel koorzang aan de Kinderkoor Academie Nederland bij. Ik besloot in 2007 om over te stappen op de altviool. Ik kreeg daarna ruim acht jaar les van Julia Dinerstein aan het Rotterdamse Hellendaal Instituut. In die acht jaar ben ik ook begonnen met het spelen in jeugdorkesten zoals het Stanislas (school)orkest, het Concerto Grosso en Viotta Jeugdorkest, waar ik ontdekte dat altviool spelen écht leuk is, en dat ik heus niet de enige was die het liefst hele weekenden muziek maakte. Sinds september 2015 studeer ik altviool aan het Koninklijk Conservatorium in Den Haag bij Mikhail Zemtsov. Ik ben blij dat ik de Dutch Viola Society vanaf 1 juli 2017 op deze manier mag gaan helpen. Voorheen was ik al fervent sticker-uitdeler, video-editor en spullen-sjouwer van de DVS, maar door deze functie hoop ik de altviool nog beter onder de aandacht te brengen. Zijn er administratieve vragen of klopt er iets niet met uw gegevens? Mail dan naar: secretaris@dutchviolasociety.nl. Met meer gemak musiceren, kunnen wij dit nu? Ik ben Sofie Booy, ik ben 18 jaar en volg sinds begin december 2016 altvioollessen bij Karin Dolman. Ik heb weleens last van kramp in mijn linkerschouder, en gespannenheid waardoor mijn stok gaat trillen, daarom dacht ik dat het handig was om naar deze cursus te gaan. Ik ben namelijk zelfs gespannen in mijn schouders en handen als ik fiets. Zondag 21 mei gingen wij (Karin, Jonas, Sylven, Tim en ik) met zijn vijven en vijf altviolen in een auto op weg naar het Akoesticum in Ede, voor de workshop ‘Met meer gemak musiceren’. Wij kwamen aan in de studio, naast Eileen McEwan (die de cursus gaf) was er nog één iemand anders. In totaal waren we dus met zijn zessen die de cursus volgden, wat op zich wel fijn was, hier kom ik later op terug. Door middel van een PowerPoint begon ze de cursus/workshop. Ze vertelde wat over zichzelf en daarna moesten wij ons voorstellen, hoe je heet, hoelang je speelt en waarom je hier bent gekomen. Daarna begon ze met de theorie over hoe ons lichaam in elkaar zit. Bindweefsel is belangrijk en daar kwam ze ook vaak op terug naarmate de cursus volgde. Het zorgt ervoor dat alles soepel gaat in de spieren en botten maar geeft ook stevigheid en is een soort beschermlaag. Vervolgens liet ze filmpjes zijn van verschillende mensen die aan het lopen waren, met lijnen erdoor zodat je goed kon zien of ze recht lopen. Daarna liet ze een filmpje zien van iemand die zonder benen ‘liep’ en daar zag je hoe belangrijke de functie van de rug is. Die moet recht en flexibel zijn, eigenlijk bij alles wat je doet. Na de theorie gingen we beginnen met wat oefeningen. We lieten onze armen langs ons lichaam hangen en gingen een beetje voorover ‘bukken’. En toen hetzelfde maar dan als je rechtop zit. Jullie snappen natuurlijk wel wat makkelijker ging. Als je recht op zit en je ademt diep in dan worden je spieren langer, als je hele tijd gebukt loopt of wat dan ook, dan heb je kortere spieren. We gingen zitten met beide voeten op de grond en onze handen onder je benen. Je moest je handen zo ver mogelijk naar achteren schuiven tot dat je je ‘zitbot’ voelde. Als je dat kon voelen moest je je handen gewoon naast je lichaam houden en net iets voor het zitbot gaan zitten. Dan zit je recht. En dat is eigenlijk al heel belangrijk. Met staan geldt eigenlijk precies hetzelfde, je moet zelf een beetje je bekken naar voren en achteren bewegen en kijken wat fijn voelt, waardoor ook je borstbeen recht te staan komt en je het gevoel hebt dat je bekken en borstbeen op een lijn zitten. Verder was er nog een oefening dat je op je op kiezelstenen moest gaan staan en je focus breed houden, hoeveel voel je dan nog van de kiezels? En als je je focust op een klein ding (in ons geval als we spelen dus op noten) hoe goed voel je dan nog de kiezels? Het kwam erop neer wanneer je gefocust bent op een detail, dat je dan de kiezels veel minder voelt. Vervolgens ging ze bij iedereen kijken hoe je je altviool op je schouder legt, en hoe je dat eigenlijk zou moeten doen. Ze kon hierdoor bij iedereen goed zien hoe het ging en wat er fout was, dat kan normaal niet met een wat grotere groep mensen. Nu kwamen we bij sommigen tot de conclusie dat bijvoorbeeld de kinsteun verhoogd zou moeten worden, of in mijn geval een andere (midden) kinsteun. Ik had wel regelmatig last van mijn linkerschouder, omdat ik die dus naar voren houd, om mijn alt recht te houden. Ook had/heb ik mijn benen altijd gestrekt als ik sta, vooral mijn knieholtes, waardoor ik niet vrijuit kan bewegen en het altijd een beetje krampachtig gaat. Ik vertel dit erbij zodat als je dit leest, je het ook bij je zelf kan controleren en misschien lost dat wel je probleem op! We kregen allemaal dingen waarop we moeten letten, maar wat voor iedereen natuurlijk even wennen is omdat je eenmaal gewend bent aan wat je normaal doet. We hebben geen spagaat gedaan en kunnen nu ook nog geen Paganini spelen. Maar we kunnen wel recht zitten en staan en hopelijk zijn onze problemen nu verholpen, als je er maar aan blijft denken: Staan mijn benen/voeten goed? Is mijn rug recht? Ben ik niet gespannen in mijn schouders? Et cetera. We hebben een leuke en leerzame middag gehad. Met dank aan Karin die ons op de cursus heeft gewezen en Eileen die dus cursus gaf. 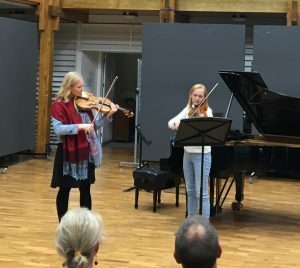 On June 10th – 11th, the DVS organises a Masterclass weekend in Dordrecht with focus on Brahms chamber music for/with a viola. 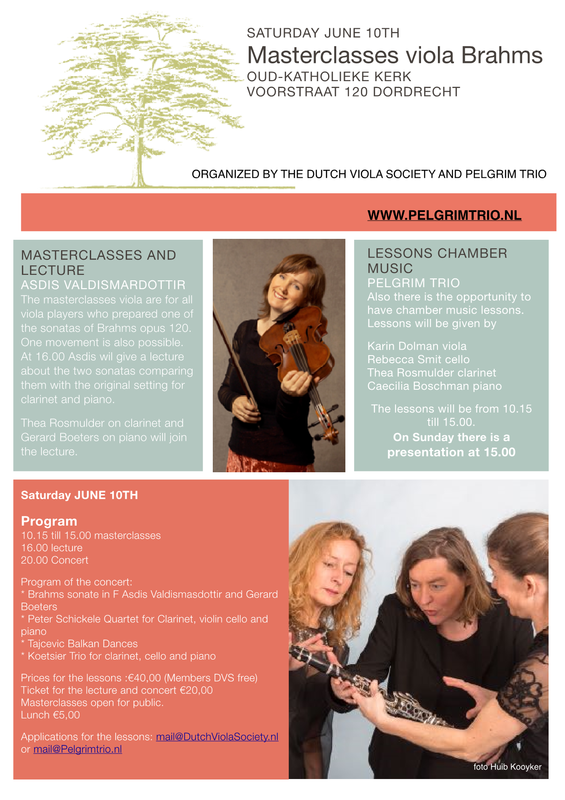 Course teachers are members of the Pelgrim Trio: Karin Dolman (viola), Thea Rosmulder (clarinet) and Caecilia Boschman (piano). As special part of this masterclass weekend, Asdis Valdimarsdottir will hold a lecture / workshop on the Brahms viola/clarinet sonatas op.120 (originally scheduled last month – see a detailed description of this workshop here). 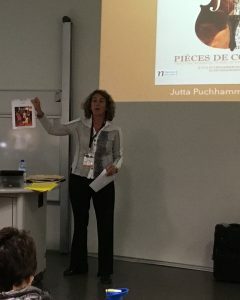 On the Saturday evening, the teachers give a concert, and on Sunday afternoon, all masterclass participants give a presentation of their work. All details about schedule and audience/participation fees are shown in the poster above. Various parts of the programme are free or reduced rate for DVS Friends. 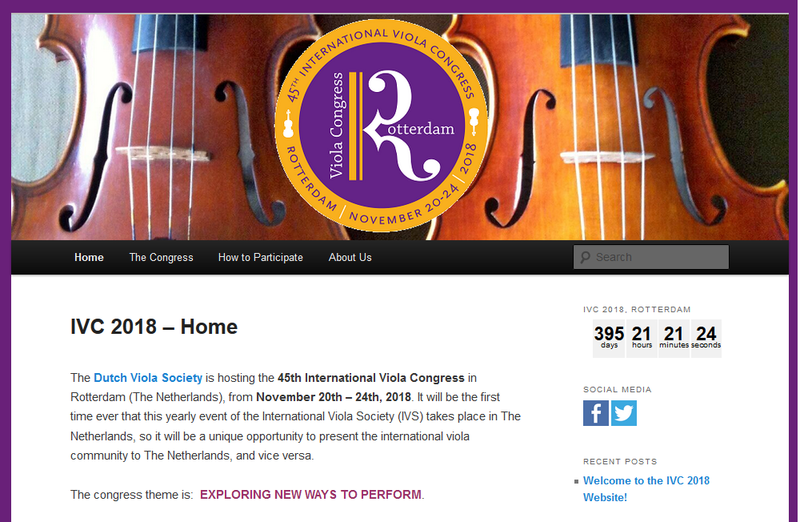 Register by sending an e-mail to mail@dutchviolasociety.nl.